KDH always does a great job with their fireworks. Feel free to watch them from the beach which is wide at the section of the OBX. As with all fireworks displays, be mindful of where you park – don’t block driveways and pay attention to parking signs. The beach in front of the Sea Ranch Resort is a GREAT place to watch these fireworks. Join us for the fun! More information about KDH fireworks here. Manteo has great fireworks every year. This quaint town is known for quality festivities throughout the year, and July 4th is no different. There is music in the afternoon and early evening, featuring Martin Terry, Echoes of Heritage, Old Enough to Know Better, and the Lost Colony Choir. The National Anthem will be sung by Megan Glover. You can find more information here. This event starts early with an afternoon filled with family activities and transforms with a fireworks display at dusk. 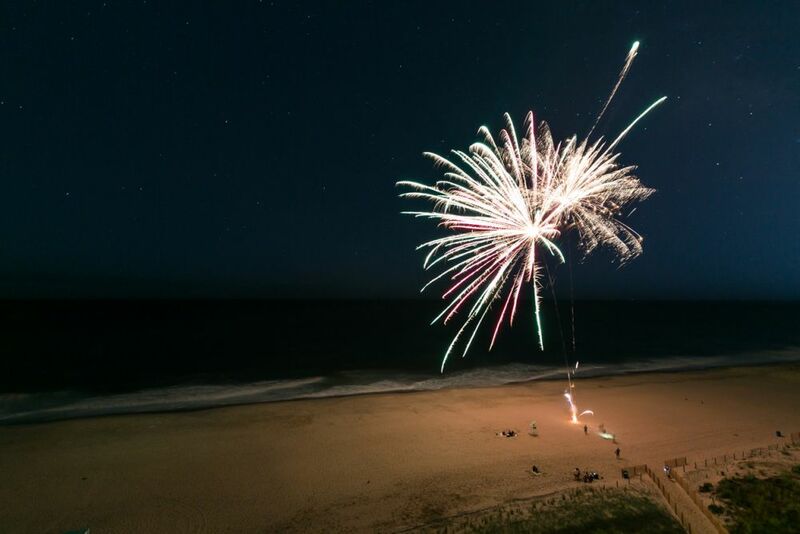 Historic Corolla Park is a wonderful place to experience July 4th Outer Banks Fireworks with your family and friends.